If you’re a regular reader, you’ve probably noticed the longer and longer gaps between posts. After a lot of thought, we’ve decided to no longer update Thrifty Threads, but we will keep the blog live. Each of us has evolved and grown over the last (nearly) four years, and we can’t thank you enough for being a part of our lives. Our first posts were about Black Friday in 2009, and we’ve loved sharing our thrifty shopping adventures over the years. Personally, I still refer to outfit posts to remember the different ways I wore pieces from my closet. 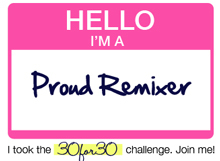 We’ve all experimented with different ways to wear clothing — like when Shannon and I participated in the 30×30 challenge — and our sartorial tastes have certainly evolved from fresh-out-of-college to a little more refined late-20s look. Since we started, Shannon and Jenny have migrated to New York City, and Katy moved back to Atlanta from Washington, D.C. Each of us has changed jobs and moved at least once. And Kristen and Katy both got married. If you’re just stumbling upon this blog, we have 357 posts since Nov. 27, 2009 — most of which relate to affordable clothing and thrift store tips and finds — and we hope you enjoy them. Thank you so much for being a part of Thrifty Threads, and happy thrifting! In my last post I wrote about a sale at the East Point warehouse of The Clothing Warehouse. Well, I made the trek myself — my first to East Point, aside from getting lost while trying to find my way home from the airport. There were bins upon bins of dresses, sweater, pants, skirts, boots, jackets, and more. Most items were winter wear, which is what they were hoping to get rid of to make room for the new stock. Since it’s been so hot in Atlanta, it is hard to imagine it will ever be cold again and that dresses with long sleeves might be a good thing. I chose the wrap skirt (at right) because it’s so comfortable, silky, and I can easily see wearing it to a Saturday morning farmers market. I might be able to wear dress No. 1 below during warmer months, but I’m also considering having it shortened. I’m only 5’4″, so the dress hits about mid-calf. No. 2 is definitely intended for the coldest weather with full long sleeves. I’ve had an eye out for tie blouses, and this dress has one of its own. It’s a little busy for so much fabric, but I plan to style it with tall boots and either a blazer or cardigan. I liked the colors on No. 3, but I haven’t totally figured out how to style it yet. Any suggestions for this one or any of the others? Sale Alert: The Clothing Warehouse in East Point, Ga.
A while back, Kristen wrote about her experience at The Clothing Warehouse’s By the Pound (BTP) location in East Point, Ga.BTP is now gone and The Clothing Warehouse is using the building to house its merchandise. THIS Thursday and Friday (June 6-7), they’re having a two-day spring cleaning sale of wholesale merchandise that hasn’t made it to the retail store in Little Five Points. A representative from The Clothing Warehouse told me it’s to make room for orders that will be arriving in a few weeks. Thursday, June 6 from 10 a.m. to 6 p.m.
Friday, June 7 from 11 a.m. to 3 p.m. According to The Clothing Warehouse Facebook page, it is merchandise such as cowboy boots, dresses, and other vintage-wear that would normally be sold in the store. The rep said it’s stuff that would sell for about $20-120 in the retail store, but at a fraction of the cost. A couple years ago, I got my cowboy boots at the L5P location (using a Scoutmob discount), and I’ve gotten a lot of use out of them. I’ve never purchased anything else there, but I always enjoy browsing when I can pop in. Honestly, the prices are a little steep for my thrifty mentality, but with good discounts, this warehouse sale sounds promising. East Point is only about 20 minutes from Atlanta, so I’m going to try to make it to the sale if I can. Note: A representative of The Clothing Warehouse reached out and provided information, but I am not being paid for this post. Well … it’s been quite awhile. What have I been up to in the almost two years it’s been since I last checked in here? I won’t bore you with details, but I will say that I have a new job and I get paid to think about makeup (and social media) all day. It’s kind of awesome, but doesn’t necessarily lend itself to actively blogging off the clock. I was going to write about my new skin care and makeup routine, but that seemed a bit self-serving. So I’ll spare you the details and write about clothes instead. Although my new job is crazy/awesome, the environment is definitely much more corporate than any other office I’ve ever worked in. (Jeans are essentially not an option.) It’s fun looking a bit nicer every day, but it was a bit of a challenge for the first few weeks since the majority of my wardrobe was so casual. I’m also at a point in my life where I’m willing to pay a little more for good staples, such as dresses and shoes for work. I’ll be re-wearing them often, so they need to be able to hold up through multiple cycles in the washing machine, but also look nice enough to wear to the office. With the above in mind, I set out in March and April to get my wardrobe in shape. While I love thrifting, it wasn’t really an option because I needed a good amount of new clothes, fast, and I had a very specific style in mind. I ended up getting a great selection of clothes and shoes from Gap, Macy’s, H&M, Ann Taylor and calvinklein.com. Everything I bought was on sale (in most cases, 50% off!) and are classic pieces that will last a long time. Below are some of my new favorites. (Please forgive my lazy copy/paste job; I haven’t blogged in awhile so I need to ease back into it…) I think it’s pretty clear the style I gravitate toward – somewhat fitted sheath dresses with good structures, and of course, fun shoes to jazz things up. My biggest advice when looking for nice staples outside of thrift stores? Be patient. Department stores have sales all the time, but the nicer designers typically only go on sale a few times a year and you can usually score major deals then. I only shop during big sales and it’s definitely paid off. Check designers’ websites. They often have random sales during the week and that’s how I scored 50% off of sale items at both anntaylor.com and calvinklein.com. Email notifications can be annoying, but if it’s a brand or designer you love, you’ll welcome that special sale email in your inbox. Stick to classic styles you love, that you know you’ll wear often and won’t go out of style. Then, be patient and wait for the sales! How has your work wardrobe evolved over the years? Eric and I celebrated our one year anniversary a week or so ago. It is crazy to think we’ve already been married a year — time certainly does fly. We took a trip to New Orleans, and while we were there, ate a fancy dinner out to commemorate a successful first year. Eric bestowed me with choosing where we went so we ended up at John Besh’s Restaurant August (a delicious, yet not thrifty choice). It was a fancier place so I knew I wanted to dress up. It was a no brainer that I wore this dress. Top photo is me in said dress at dinner (which a delicious malbec) and the bottom one is the dress hanging up on my closet door. I did not get a full length photo of me in it. 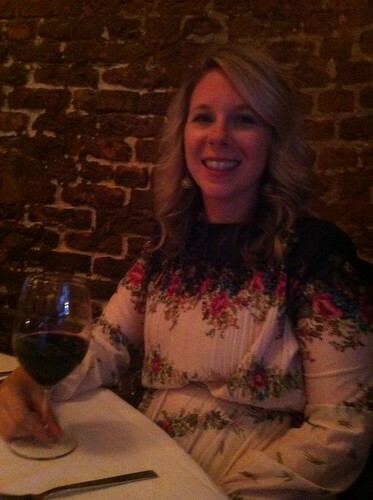 I got SO many compliments on this dress, both from the photos I posted of it online and from people at the restaurant. I found it amusing because it was a $10 thrift store found. A few months back when Melanie and I took a tour of some of the local thrift stores, I picked this up at the Rag-O-Rama on Roswell Road. I initially purchased it to wear to the thrift store party I talked about a post or two ago, but I decided I’d rather hold on to it for a special occasion. The tag says it is JCPenney brand. And I have no idea what year it is from. But I love it. It is very lightweight and sheer (I wore a long slip underneath it) but it was super cute. Have you ever gotten complimented on your thrift store finds? OK, so I have developed a bit of a Goodwill problem since moving back to Atlanta. I supposed there are worse problems to have, but when you are unemployed, you shouldn’t be popping in to said thrift store to purchase clothes which you do not need. I think that I am trying to figure out which Goodwills around here have the best stuff. And I go to a few, find good stuff, buy it and share it here. I think that is legit. I have been in the market for jackets. Which is weird because I live in the South again and we all know how Georgia summers can be. When I mean jackets, I don’t mean coats. I mean something that is a big more casual than a blazer. Something I can throw on over a top when it’s chilly or as a finishing piece etc. The thing about not having a job is that you quickly realize the wardrobe you have crafted for an office doesn’t really lend itself to to life of someone who spends their day seeking jobs. I haven’t had a need for blazers (apart from the few interviews I have been on) but I have found myself wishing I had some jackets to wear. So I ventured in to Goodwill with that purpose. I was up in Alpharetta (which I most certainly won’t be very often) so I check out the Goodwill up there. And boy, did I hit the jackpot. Clockwise from top left: Light brown jacket from Ann Taylor Loft, black jacket from Express, khaki shirt dress from Target, blue and gray striped blazer from some brand I don’t know. Not pictures: navy jacket from Chicos. 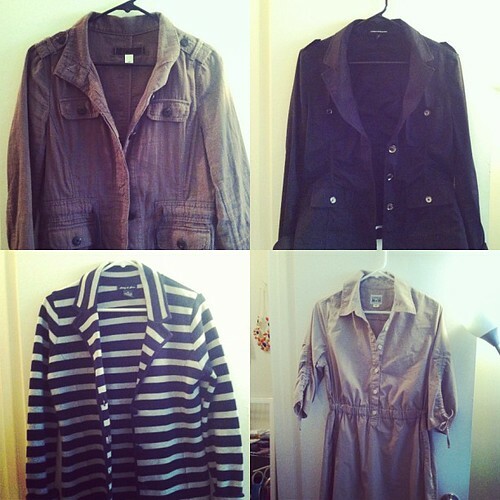 I got four jackets and the dress for 30 bucks. Pretty proud of myself. They all fit me well and are what I was on the search for. I had been wanting a striped blazer for awhile (we all know how much I love stripes) so I was floored that I found one that was perfect. The shirt dress doesn’t fit in to the jacket scheme but it was super cute on and only five bucks. I usually try to avoid buying stuff at thrift stores from Target, Old Navy, etc. but I really liked this so I made an exception. It is coming with my to New Orleans this weekend. So this trip to Goodwill happened on Monday. Well the day before that on Sunday, I went to the Goodwill closest to me by Perimeter Mall. I have already had some success here since moving including finding a J. 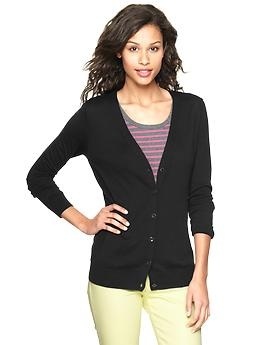 Crew cardigan and a few Banana Republic tops. 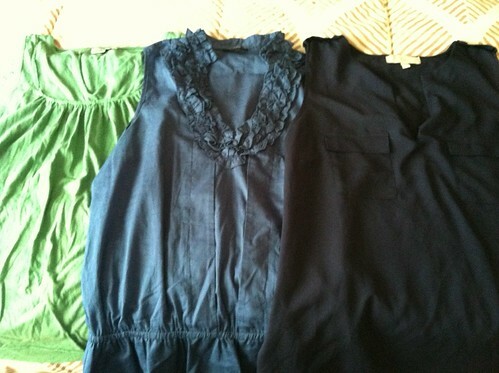 I went there looking for jackets, but ended up leaving with a handful of sleeveless tops, which are pretty much the opposite of the jackets pictured above. 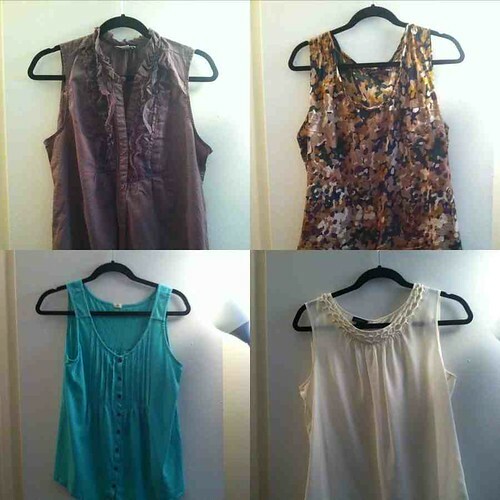 Clockwise from top left: Dusty purple top from Ann Taylor Loft, multicolored top from Eddie Bauer, cream top from Talbots and teal top from J.Crew. This totaled about 18 bucks. I bet each of these shirts when originally purchased were way more than 18 bucks so I made out like a bandit. I love sleeveless tops. 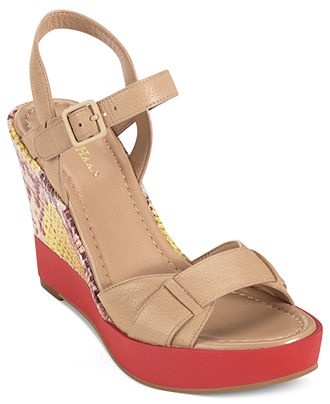 They are great in the summer to pair with jeans or shorts (if it is really hot). And all of these (as well as the ones I bought a week or so ago that I shared on here) can be paired with work pants or a skirt to wear to the office when I finally get a job. I am excited to wear the teal J. Crew top with my white jeans soon. So for about 50 bucks, I got all of those clothes plus a jacket that isn’t pictured. This is why thrifting is so awesome. I’ve been really impressed with the Goodwills in the Atlanta area. They are all organized the same from store to store which makes it easy to browse. I would say that I am done thrifting for now, but we all know that isn’t the case so why pretend? I went to a “thrift shop” party a week or so ago. Inspired by Macklemore’s ubiquitous hit, the idea was to find the most outrageous outfit you could at a thrift store and wear it to the party. Now we’ve all seen some crazy stuff at thrift stores, so it shouldn’t be a stretch to find something wacky. 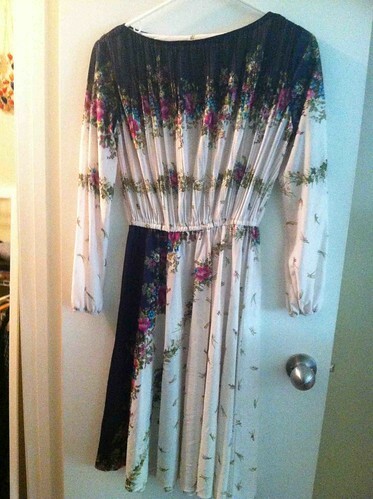 Old prom dresses. Pant suits. A variety of animal prints. While at the party, I overheard some people talking about their trips to the local thrift stores and joking about how there were a bunch of people who were there “shopping for real.” I was slightly taken aback. As someone who frequents thrift stores for clothing, I do realize there is a stigma that can be associated with it. And to be honest, there is a lot of not-so-desirable items among the racks. But if you search, you can find a bunch of great stuff. And that is why I do it. I love combing through the racks and pulling out the J Crew cardigan in great condition and buying it. Or taking home the Ann Taylor dress for 8 bucks that fits me perfectly. Now I could go in to the aforementioned stores and buy the items for full price, but the thrill of finding it for cheaper is why I keep going back to thrift stores. It isn’t because I can’t afford new things — it is because I genuinely enjoy the process. And it isn’t just the name brands that I love to buy. I have found some great off-brand pieces that have a regular place in my wardrobe. For those reasons and many more, I will probably be a thrift store shopper for the rest of my life. And I will teach my kids the joy of thrifting as well. While on that note, let me share what I picked up at Goodwill over the weekend. I popped in on Saturday to look for a tablecloth (which I did not find). 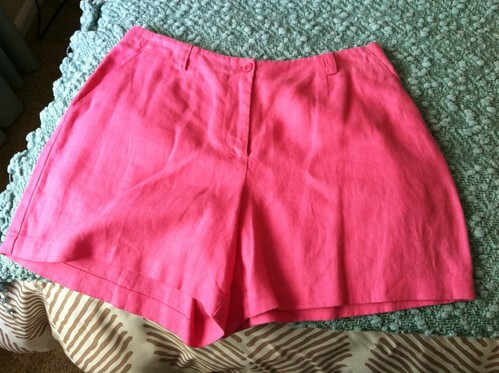 But I did get a few tops and a pair of hot pink shorts. All of these will get plenty of wear this summer. Our eyes are bigger than our paychecks. Enter your e-mail address to get notifications of new posts delivered straight to your inbox!